“Good” is a curious word to apply to any warfare. All worldly war is more or less evil. No doubt it is an absolute necessity in many cases – to procure the liberty of nations, to prevent the weak from being trampled down by the strong – but still it is an evil. It entails an awful amount of bloodshed and suffering. It hurries into eternity myriads who are completely unprepared for their change. It calls forth the worst passions of man. It causes enormous waste and destruction of property. It fills peaceful homes with mourning widows and orphans. It spreads far and wide poverty, taxation and national distress. It disarranges all the order of society. It interrupts the work of the Gospel and the growth of Christian Missions. In short, war is an immense and incalculable evil and every praying man should cry night and day, “Give peace in our time.” And yet there is one warfare which is emphatically “good” and one fight in which there is no evil. That warfare is the Christian warfare. That fight is the fight of the soul. Now what are the reasons why the Christian fight is a “good fight”? What are the points in which his warfare is superior to the warfare of this world? Let me examine this matter and open it out in order. I dare not pass the subject and leave it unnoticed. I want no one to begin the life of a Christian soldier without counting the cost. I would not keep back from anyone that if he would be holy and see the Lord he must fight and that the Christian fight, though spiritual, is real and severe. It needs courage, boldness and perseverance. But I want my readers to know that there is abundant encouragement to begin the battle. The Scripture does not call the Christian fight “a good fight” without reason and cause. Let me try to show what I mean. (a) The Christian fight is good because it is fought under the best of generals. The Leader and Commander of all believers is our Divine Saviour, the Lord Jesus Christ – a Saviour of perfect wisdom, infinite love and almighty power. The Captain of our salvation never fails to lead His soldiers to victory. He never makes any useless movement, never errs in judgment, never commits any mistake. His eye is on all His followers, from the greatest of them even to the least. The humblest servant in His army is not forgotten. The weakest and most sickly is cared for, remembered and kept unto salvation. The souls whom He has purchased and redeemed with His own blood are far too precious to be wasted and thrown away. Surely this is good! (b) The Christian’s fight is good, because fought with the best of helps. Weak as each believer is in himself, the Holy Spirit dwells in him and his body is a temple of the Holy Ghost. Chosen by God the Father, washed in the blood of the Son, renewed by the Spirit, he does not go a warfare at his own charges and is never alone. God the Holy Ghost daily teaches, leads, guides and directs him. God the Father guards him by His almighty power. God the Son intercedes for him every moment, like Moses on the Mount, while he is fighting in the valley below. A threefold cord like this can never be broken! His daily provisions and supplies never fail. His commissariat is never defective. His bread and his water are sure. Weak as he seems in himself, like a worm, he is strong in the Lord to do great exploits. Surely this is good! (c) The Christian fight is a good fight, because fought with the best of promises. To every believer belong exceeding great and precious promises – all Yea and Amen in Christ – promises sure to be fulfilled, because made by One who cannot lie and has power as well as will to keep His word. “Sin shall not have dominion over you.” – “The God of peace shall bruise Satan under your feet shortly.” – “He which hath begun a good work in you will perform it until the day of Jesus Christ.” – “When thou passest through the waters, I will be with thee: and through the rivers, they shall not overflow thee.” – “My sheep shall never perish, neither shall any man pluck them out of My hand.” – “Him that cometh to Me I will in no wise cast out.” – “I will never leave thee, nor forsake thee.”- “I am persuaded, that neither death, nor life, nor things present, nor things to come, shall be able to separate us from the love of God, which is in Christ Jesus.” (Rom. 6:14; Rom. 16:20; Phil. 1:6; Isa. 43:2; John 10:28; John 6:37; Heb. 13:5; Rom. 8:38). Words like these are worth their weight in gold! Who does not know that promises of coming aid have cheered the defenders of besieged cities, like Lucknow, and raised them above their natural strength? Have we never heard that the promise of “help before night” had much to say to the mighty victory of Waterloo? Yet all such promises are as nothing compared to the rich treasure of believers, the eternal promises of God. Surely this is good! (d) This Christian’s fight is a good fight, because fought with the best of issues and results. No doubt it is a war in which there are tremendous struggles, agonising conflicts, wounds, bruises, watchings, fastings and fatigue, but still every believer, without exception, is more than conqueror “through Him that loved us” (Rom 8:37). No soldiers of Christ are ever lost, missing, or left dead on the battlefield. No mourning will ever need to be put on and no tears to be shed for either Private or Officer in the army of Christ. The muster roll, when the last evening comes, will be found precisely the same that it was in the morning. The English Guards marched out of London to the Crimean campaign a magnificent body of men; but many of the gallant fellows laid their bones in a foreign grave and never saw London again. Far different shall be the arrival of the Christian army in “The city which hath foundations, whose builder and maker is God” (Heb. 11:10). Not one shall be found lacking. The words of our great Captain shall be found true: “Of them which Thou gavest Me have I lost none” (John 18:9). Surely this is good! (e) The Christian’s fight is good, because it does good to the soul of him that fights it. All other wars have a bad, lowering and demoralising tendency. They call forth the worst passions of the human mind. They harden the conscience and sap the foundation of religion and morality. The Christian warfare alone tends to call forth the best things that are left in man. It promotes humility and charity, it lessens selfishness and worldliness, it induces men to set their affections on things above. The old, the sick, the dying, are never known to repent of fighting Christ’s battles against sin, the world and the Devil. Their only regret is that they did not begin to service Christ long before. The experience of that eminent saint, Philip Henry, does not stand alone. In his last days he said to his family, “I take you all to record that a life spent in the service of Christ is the happiest life that a man can spend upon earth.” Surely this is good! (f) The Christian’s fight is a good fight, because it does good to the world. All other wars have a devastating, ravaging and injurious effect. The march of an army though a land is an awful scourge to the inhabitants. Wherever it does it impoverishes, wastes and invariably does harm. Injury to persons, property, feelings and morals invariably accompanies it. Far different are the effects produced by Christian soldiers. Wherever they live they are a blessing. They raise the standard of religion and morality. They invariably check the progress of drunkenness, Sabbath-breaking, profligacy and dishonesty. Even their enemies are obliged to respect them. Go where you please, you will rarely find that barracks and garrisons do good to the neighbourhood. But go where you please, you will find that the presence of a few true Christians is a blessing. Surely this is good! (g) Finally, the Christian’s fight is good, because it ends in a glorious reward for all who fight it. Who can tell the wages that Christ will pay to all His faithful people? Who can estimate the good things that our Divine Captain has laid up for those who confess Him before men? A grateful country can give to her successful warriors medals, Victoria Crosses, pensions, peerages, honour and titles, but it can give nothing that will last and endure for ever, nothing that can be carried beyond the grave. Places like Blenheim and Strathfieldsay can only be enjoyed for a few years. The bravest generals and soldiers must go down one day before the King of Terrors. Better, far better, is the position of him who fights under Christ’s banner against sin, the world and the Devil. He may get little praise of man while he lives and go down to the grave with little honour; but he shall have that which is far better, because far more enduring. He shall have “a crown of glory that fadeth not away” (1 Pet. 5:4). Surely this is good! Let us settle it in our minds that the Christian fight is a good fight – really good, emphatically good. We see only part of it as yet. We see the struggle, but not the end; we see the campaign, but not the reward; we see the cross, but not the crown. We see a few humble, broken-spirited, penitent, praying people, enduring hardships and despised by the world; but we see not the hand of God over them, the face of God smiling on them, the Kingdom of glory prepared for them. These things are yet to be revealed. Let us not judge by appearances. There are more good things about the Christian warfare than we see. And now let me conclude my whole subject with a few words of practical application. Our lot is cast in times when the world seems thinking of little else but battles and fighting. The iron is entering into the soul of more than one nation and the mirth of many a fair district is clean gone. Surely in times like these a Minister may fairly call on men to remember their spiritual warfare. Let me say a few parting words about the great fight of the soul. (1.) It may be you are struggling hard for the rewards of this world. Perhaps you are straining every nerve to obtain money, or place, or power, or pleasure. If that be your case, take care. Your sowing will lead to a crop of bitter disappointment. Unless you mind what you are about, your latter end will be to lie down in sorrow. For your own happiness’ sake resolve this day to seek to join the Lord’s side. Shake off your past carelessness and unbelief. Come out from the ways of a thoughtless, unreasoning world. Think what the children of this world will often do for liberty, without any religious principle. Remember how Greeks, and Romans, and Swiss, and Tyrolese, have endured the loss of all things, even life itself, rather than bend their necks to a foreign yoke. Let their example provoke you to emulation. If men can do so much for a corruptible crown, how much more should you do for one which is incorruptible! Fear not to enlist under Christ’s banner. The great Captain of your salvation rejects none that come to Him. None who repent and believe are too bad to be enrolled in the ranks of Christ’s army. All who come to Him by faith are admitted, clothed, armed, trained and finally led on to complete victory. Fear not to go on fighting, if you once enlist. The more thorough and whole-hearted you are as a soldier, the more comfortable will you find your warfare. No doubt you will often meet with trouble, fatigue and hard fighting, before your warfare is accomplished. But let none of these things move you. Greater is He that is for you than all they that be against you. Everlasting liberty or everlasting captivity are the alternatives before you. Choose liberty and fight to the last. (2.) It maybe you know something of the Christian warfare, and are a tried and proved soldier already. If that be your case, accept a parting word of advice and encouragement from a fellow-soldier. Let me speak to myself as well as to you. Let us stir up our minds by way of remembrance. There are some things which we cannot remember too well. Let us remember the solemn words of an inspired warrior, who went to his rest 1800 years ago: “No man that warreth entangleth himself with the affairs of this life; that he may please Him who hath chosen him to be a soldier” (2 Tim. 2:4). May we never forget that saying! Let us remember that some have seemed good soldiers for a little season and talked loudly of what they would do and yet turned back disgracefully in the day of battle. Let us never forget Balaam, Judas, Demas and Lot’s wife. Whatever we are and, however weak, let us be real, genuine, true and sincere. Let us remember that the eye of our loving Saviour is upon us morning, noon and night. He will never suffer us to be tempted above that we are able to bear. He can be touched with the feeling of our infirmities, for He suffered Himself being tempted. He knows what battles and conflicts are, for He Himself was assaulted by the Prince of this world. Having such a great High Priest, Jesus the Son of God, let us hold fast our profession (Heb. 4:14). Let us remember that thousands of soldiers before us have fought the same battle that we are fighting and come off more than conquerors though Him that loved them. They overcame by the blood of the Lamb; and so also may we. Christ’s arm is quite as strong as ever and Christ’s heart is just as loving as ever. He that saved men and women before us is the One who never changes. He is “able to save them to the uttermost that come unto God by Him.” Then let us cast doubts and fears away. Let us “follow them who through faith and patience inherit the promises,” and are waiting for us to join them (Heb. 7:25; 6:12). Finally, let us remember that the time is short and the coming of the Lord draweth nigh. A few more battles and the last trumpet shall sound and the Prince of Peace shall come to reign on a renewed earth. A few more struggles and conflicts and then we shall bid an eternal goodbye to warfare and to sin, to sorrow and to death. Then let us fight on to the last and never surrender. Thus saith the Captain of our salvation – “He that overcometh shall inherit all things; and I will be His God, and He shall be my Son.” (Rev 21:7). May we never forget that without fighting there can be no holiness while we live and no crown of glory when we die! In this respect, the Christian warfare is utterly unlike the conflicts of this world.It does not depend on the strong arm, the quick eye, or the swift foot. It is not waged with carnal weapons, but with spiritual. Faith is the hinge on which victory turns. Success depends entirely on believing. foundation of the Christian soldier’s character. He is what he is, does what he does, thinks as he thinks, acts as he acts, hopes as he hopes, behaves as he behaves, for one simple reason – he believes certain propositions revealed and laid down in Holy Scripture. “He that cometh to God must believe that He is, and that He is a Rewarder of them that diligently seek Him” (Heb. 11:6). A religion without doctrine or dogma is a thing which many are fond of talking of in the present day. It sounds very fine at first; it looks very pretty at a distance; but the moment we sit down to examine and consider it, we shall find it a simple impossibility. We might as well talk of a body without bones and sinews. No man will ever be anything or do anything in religion, unless he believes something. Even those who profess to hold the miserable and uncomfortable views of the Deists are obliged to confess that they believe something. With all their bitter sneers against dogmatic theology and Christian credulity, as they call it, they themselves have a kind of faith. was a clever man, but a poor divine. There is no such thing as right living without faith and believing. A special faith in our Lord Jesus Christ’s person, work and office is the life, heart and mainspring of the Christian soldier’s character. He sees by faith an unseen Saviour, who loved him, gave Himself for him, paid his debts for him, bore his sins, carried his transgressions, rose again for him and appears in Heaven for him as his Advocate at the right hand of God. He sees Jesus and clings to Him. Seeing this Saviour and trusting in Him, he feels peace and hope and willingly does battle against the foes of his soul. He sees his own many sins – his weak heart, a tempting world, a busy Devil; and if he looked only at them he might well despair; but he sees also a mighty Saviour, an interceding Saviour, a sympathising Saviour – His blood, His righteousness, His everlasting priesthood – and he believes that all this is his own. He sees Jesus and casts his whole weight on Him. Seeing Him he cheerfully fights on with a full confidence that he will prove “more than conqueror through Him that loved him” (Rom. 8:37). Habitual lively faith in Christ’s presence and readiness to help is the secret of the Christian soldier fighting successfully. I think it impossible to over-rate the value and importance of faith. Well may the Apostle Peter call it “precious” (2 Pet. 1:1). Time would fail me if I tried to recount a hundredth part of the victories which by faith Christian soldiers have obtained. Let us take down our Bibles and read with attention the eleventh chapter of the Epistle to the Hebrews. Let us mark the long list of worthies whose names are thus recorded, from Abel down to Moses, even before Christ was born of the Virgin Mary and brought life and immortality into the full light of the Gospel. Let us note well what battles they won against the world, the flesh and the Devil – and then let us remember that believing did it all. These men looked forward to the promised Messiah. They saw Him that is invisible. “By faith the elders obtained a good report” (Heb. 11:2-27). Let us turn to the pages of early Church history. Let us see how the primitive Christians held fast their religion even unto death and were not shaken by the fiercest persecutions of heathen Emperors. For centuries, there were never wanting men like Polycarp and Ignatius, who were ready to die rather than deny Christ. Fines and prisons and torture and fire and sword were unable to crush the spirit of the noble army of martyrs. The whole power of imperial Rome, the mistress of the world, proved unable to stamp out the religion which began with a few fishermen and publicans in Palestine! And let us remember that believing in an unseen Jesus was the Church’s strength. They won their victory by faith. Let us examine the story of the Protestant Reformation. Let us study the lives of its leading champions – Wycliffe, and Huss, and Luther, and Ridley, and Latimer, and Hooper. Let us mark how these gallant soldiers of Christ stood firm against a host of adversaries and were ready to die for their principles. What battles they fought! What controversies they maintained! What contradiction they endured! What tenacity of purpose they exhibited against a world in arms! And then let us remember that believing in an unseen Jesus was the secret of their strength. They overcame by faith. Let us consider the men who have made the greatest marks in Church history in the last hundred years. 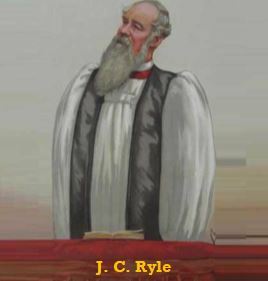 Let us observe how men like Wesley, and Whitfield, and Venn, and Romaine, stood alone in their day and generation and revived English religion in the face of opposition from men high in office and in the face of slander, ridicule and persecution from nine-tenths of professing Christians in our land. Let us observe how men like William Wilberforce, and Havelock, and Hedley Vicars, have witnessed for Christ in the most difficult positions and displayed a banner for Christ even at the regimental mess-table, or on the floor of the House of Commons. Let us mark how these noble witnesses never flinched to the end and won the respect even of their worst adversaries; and then let us remember that believing in an unseen Christ is the key to all their characters. By faith they lived and walked and stood and overcame. Would anyone live the life of a Christian soldier? Let him pray for faith. It is the gift of God; and a gift which those who ask shall never ask for in vain. You must believe before you do. If men do nothing in religion, it is because they do not believe. Faith is the first step toward Heaven. Would anyone fight the fight of a Christian soldier successfully and prosperously? Let him pray for a continual increase of faith. Let him abide in Christ, get closer to Christ, tighten his hold on Christ every day that he lives. Let his daily prayer be that of the disciples – “Lord increase my faith” (Luke 17:5). Watch jealously over your faith, if you have any. It is the citadel of the Christian character, on which the safety of the whole fortress depends. It is the point which Satan loves to assail. All lies at his mercy if faith is overthrown. Here, if we love life, we must especially stand on our guard. for a little time, and then vanisheth away. These words are most frequently used to warn sinners of the urgent necessity for them to get right with God. They certainly should make every careless soul think of the brevity of life, the certainty of death, and the solemnity of eternity. If you come to this day still in your sins, you should stop and consider this word from God. You know the gospel. You know you should call upon the Lord to have mercy upon you. You know that tomorrow it may be too late for you to call. Call upon Him today and you will find that He will have mercy and will abundantly pardon (Isa. 55:7). Yet James originally directed these words to Christians. They had become very careless about spiritual things. They were consumed with the here and now, this life with its pleasures and profits. They took time for granted and made their plans as if they wore certain to be around for a long time. Is that not how all too many of us live? We need to take James’s rebuke seriously and personally. We need to grasp again some basic facts. First, our hold on life is very tenuous. Second, at best our life will be brief. Third, in this brief life what matters is not where we have travelled or what we have gained, but how we have responded to the will of God. In the light of these things, how does your life measure up? What is your life? What motivates it? What has it accomplished? ‘The Lord asks the questions, and He will have honest answers. please ourselves but to please God. Continue Reading | Comments Off on What Is Your Life? The ancient city of Nineveh was the scene of an amazing revival in the ninth century B.C. This vast city, which had a huge population, was so full of sin that God said its wickedness had come up before Him. The Ninevites were so evil they almost seem to have compelled God to take notice of them. And yet there was revival in Nineveh—Nineveh, of all places! Now, if God could send revival to Nineveh, He can surely send it to the place where we live and work. Some people are far too pessimistic. They are so taken up with the end-time apostasy that they would feel somewhat let down if God were to send a spiritual awakening. Let us not be like that! Christians should be positive in their outlook; they should be looking for a harvest of souls. The man who hid his talent in the earth did so because he thought his lord was a mean man who could hardly be pleased. Christ is not mean. He died to save a vast multitude, and He will have that multitude with Him in heaven, out of “all nations, and kindreds, and people, and tongues” (Rev. 7:9). The revival in Nineveh affected all classes of society, all age groups, and all types of people. It led to a thorough reformation of the lives and manners of the people. The Ninevites turned from their sin to God, and God looked down from heaven approvingly and blessed them. As we read of what happened in Nineveh, we should long to see revival in our district. The devil has been blinding our neighbours and friends for far too long. Let us pray for a mighty outpouring of the Spirit of God. God chooses to blow upon His people once again. Eighteen hundred years ago, there was a man who said that he “gloried” in the cross of Christ. He was one who turned the world upside down by the doctrines he preached. He was one who did more to establish Christianity than any man that ever lived. Yet what does he tell the Galatians? – “God forbid that I should glory, save in the cross of our Lord Jesus Christ” (Gal. 6:14). Reader, the “cross of Christ” must needs be an important subject, when an inspired Apostle can speak of it in this way. Let me try to show you what the expression means. Once know what the cross of Christ means and then you may be able, by God’s help, to see the importance of it to your soul. The cross in the Bible sometimes means that wooden cross on which the Lord Jesus was nailed and put to death on Mount Calvary. This is what the Apostle Paul had in his mind’s eye when he told the Philippians that Christ “became obedient unto death, even the death of the cross” (Phil. 2:8). This is not the cross in which Paul gloried. He would have shrunk with horror from the idea of glorying in a mere piece of wood. I have no doubt he would have denounced the Roman Catholic adoration of the crucifix as profane, blasphemous and idolatrous. The cross sometimes means the afflictions and trials which believers in Christ have to go through if they follow Christ faithfully, for their religion’s sake. This is the sense in which our Lord uses the word, when He says, “He that taketh not his cross, and followeth after Me, is not worthy of Me” (Matt. 10:38). This also is not the sense in which Paul uses the word when he writes to the Galatians. He knew that cross well. He carried it patiently; but he is not speaking of it here. Reader, Jesus Christ crucified was the joy and delight, the comfort and the peace, the hope and the confidence, the foundation and the resting place, the ark and the refuge, the food and the medicine of Paul’s soul. He did not think of what he had done himself and suffered himself. He did not meditate on his own goodness and his own righteousness. He loved to think of what Christ had done and Christ had suffered – of the death of Christ, the righteousness of Christ, the atonement of Christ, the blood of Christ, the finished work of Christ. In this he did glory. This was the sun of his soul. This is the subject he loved to preach about. He was a man who went to and fro on the earth, proclaiming to sinners that the Son of God had shed His own heart’s blood to save their souls. He walked up and down the world telling sinners that Jesus Christ had loved them and died for their sins upon the cross. Mark how he says to the Corinthians, “I delivered unto you first of all that which I also received, how that Christ died for our sins” (1 Cor. 15:3). He – a blaspheming, persecuting Pharisee – had been washed in Christ’s blood: he could not hold his peace about it. He was never weary of telling the story of the cross. This is the subject he loved to dwell upon when he wrote to believers. It is wonderful to observe how full his Epistles generally are of the sufferings and death of Christ – how they run over with ‘thoughts that breathe and words that burn’ about Christ’s dying love and power. His heart seems full of the subject; he enlarges on it constantly; he returns to it continually. It is the golden thread that runs through all his doctrinal teaching and practical exhortations. He seems to think that the most advanced Christian can never hear too much about the cross. This is what he lived upon all his life, from the time of his conversion. He tells the Galatians, “The life which I now live in the flesh I live by the faith of the Son of God, who loved me and gave himself for me” (Gal. 2:20). What made him so strong to labour? What made him so willing to work? What made him so unwearied in endeavouring to save some? What made him so persevering and patient? I will tell you the secret of it all. He was always feeding by faith on Christ’s body and Christ’s blood. Jesus crucified was the meat and drink of his soul. And, reader, you may rest assured that Paul was right. Depend upon it, the cross of Christ – the death of Christ on the cross to make atonement for sinners – is the centre truth in the whole Bible. This is the truth we begin with when we open Genesis. The seed of the woman bruising the serpent’s head is nothing else but a prophecy of Christ crucified. This is the truth that shines out, though veiled, all through the law of Moses and the history of the Jews. The daily sacrifice, the Passover lamb, the continual shedding of blood in the tabernacle and the temple – all these were emblems of Christ crucified. This is the truth that we see honoured in the vision of Heaven before we close the book of Revelation. “In the midst of the throne and of the four beasts,” we are told, “and in the midst of the elders, stood a Lamb as it had been slain” (Rev. 5:6). Even in the midst of Heavenly glory we catch a view of Christ crucified. Take away the cross of Christ and the Bible is a dark book. It is like the Egyptian hieroglyphics, without the Hey that interprets their meaning – curious and wonderful, but of no real use. Reader, mark what I say. You may know a good deal about the Bible. You may know the outlines of the histories it contains and the dates of the events described, just as a man knows the history of England. You may know the names of the men and women mentioned in it, just as a man knows Caesar, Alexander the Great or Napoleon. You may know the several precepts of the Bible and admire them, just as a man admires Plato, Aristotle or Seneca. But if you have not yet found out that Christ crucified is the foundation of the whole volume, you have read your Bible hitherto to very little profit. Your religion is a Heaven without a sun, an arch without a key-stone, a compass without a needle, a clock without spring or weights, a lamp without oil. It will not comfort you. It will not deliver your soul from Hell. Reader, mark what I say again. You may know a good deal about Christ, by a kind of head knowledge. You may know who He was, and where He was born and what He did. You may know His miracles, His sayings, His prophecies and His ordinances. You may know how He lived and how He suffered and how He died. But unless you know the power of Christ’s cross by experience – unless you know and feel within that the blood shed on that cross has washed away your own particular sins – unless you are willing to confess that your salvation depends entirely on the work that Christ did upon the cross – unless this be the case, Christ will profit you nothing. The mere knowing Christ’s Name will never save you. You must know His cross and His blood, or else you will die in your sins. Reader, as long as you live, beware of a religion in which there is not much of the cross. You live in times when the warning is sadly needful. Beware, I say again, of a religion without the cross. There are hundreds of places of worship in this day, in which there is almost everything except the cross. There is carved oak and sculptured stone; there is stained glass and brilliant paintings; there are solemn services and a constant round of ordinances; but the real cross of Christ is not there. Jesus crucified is not proclaimed in the pulpit. The Lamb of God is not lifted up and salvation by faith in Him is not freely proclaimed. And hence all is wrong. Reader, beware of such places of worship. They are not apostolical. They would not have satisfied Paul. There are thousands of religious books published in our times, in which there is everything except the cross. They are full of directions about sacraments and praises of the Church; they abound in exhortations about holy living and rules for the attainment of perfection; they have plenty of fonts and crosses, both inside and outside, but the real cross of Christ is left out. The Saviour and His dying love are either not mentioned, or mentioned in an unscriptural way. And hence they are worse than useless. Reader, beware of such books. They are not apostolical. They would never have satisfied Paul. True Christianity is a fight! With whom is the Christian soldier meant to fight? Not with other Christians. Wretched indeed is that man’s idea of religion who fancies that it consists in perpetual controversy! No doubt it may be absolutely needful sometimes to appeal to law courts, in order to ascertain the right interpretation of a Church’s Articles and rubrics and formularies; but, as a general rule, the cause of sin is never so much helped as when Christians waste their strength in quarrelling with one another and spend their time in petty squabbles. No, indeed! The principal fight for the Christian is with the world, the flesh and the Devil. These are his never-dying foes. These are the three chief enemies against whom he must wage war. Unless he gets the victory over these three, all other victories are useless and vain. If he had a nature like an angel and were not a fallen creature, the warfare would not be so essential; but with a corrupt heart, a busy Devil and an ensnaring world, he must either “fight” or be lost. Some men may think these statements too strong. You fancy that I am going too far and laying on the colours too thickly. You are secretly saying to yourself that men and women in England may surely get to Heaven without all this trouble and warfare and fighting. Listen to me for a few minutes and I will show you that I have something to say on God’s behalf. Remember the maxim of the wisest General that ever lived in England – “In time of war it is the worst mistake to under-rate your enemy and try to make a little war.” This Christian warfare is no light matter. Give me your attention and consider what I say. What saith the Scripture – “Fight the good fight of faith, lay hold on eternal life.” – “Endure hardness, as a good soldier of Jesus Christ.” – “Put on the whole armour of God, that ye may be able to stand against the wiles of the Devil. For we wrestle not against flesh and blood, but against principalities, against powers, against the rulers of the darkness of this world, against spiritual wickedness in high places. Wherefore take unto you the whole armour of God, that ye may be able to withstand in the evil day, and having done all, to stand.” “Strive to enter in at the strait gate.” – “Labour for that meat which endureth unto everlasting life.” – “Think not that I come to send peace on earth: I came not to send peace, but a sword.” “He that hath no sword, let him sell his garment, and buy one.” – “Watch ye, stand fast in the faith, quit you like men, be strong.” – “War a good warfare, holding faith, and a good conscience.” (I Tim. 6:12; II Tim. 2:3; Eph. 6: 11-13; Luke 13:24; John 6:27; Matt. 10:34; Luke 22:36; I Cor. 16:13; I Tim. 1:18,19.) Words such as these appear to me clear, plain and unmistakable. They all teach one and the same great lesson, if we are willing to receive it. That lesson is – that true Christianity is a struggle, a fight and a warfare. He that pretends to condemn “fighting” appears to me to misunderstand his Bible and to make a great mistake. One thing is certain – this Christian warfare is a great reality and a subject of vast importance. It is not a matter like Church government and ceremonial, about which men may differ and yet reach Heaven at last. Necessity is laid upon us. We must fight. There are no promises in the Lord Jesus Christ’s Epistles to the Seven Churches, except to those who “overcome.” Where there is grace there will be conflict. The believer is a soldier. There is no holiness without a warfare. Saved souls will always be found to have fought a fight. It is a fight of absolute necessity. Let us not think that in this war we can remain neutral and sit still. Such a line of action may be possible in the strife of nations, but it is utterly impossible in that conflict which concerns the soul. The boasted policy of non-interference – the ‘masterly inactivity” which pleases so many Statesmen – the plan of keeping quiet and letting things alone – all this will never do in the Christian warfare. Here at any rate no one can escape serving under the plea that he is a ‘man of peace.’ To be at peace with the world, the flesh and the devil, is to be at enmity with God and in the broad way that leadeth to destruction. We have no choice or option. We must either fight or be lost. It is a fight of universal necessity. No rank, or class, or age can plead exemption or escape the battle. Ministers and people, preachers and hearers, old and young, high and low, rich and poor, gentle and simple, Kings and subjects, landlords and tenants, learned and unlearned – all alike must carry arms and go to war. All have by nature a heart full of pride, unbelief, sloth, worldliness and sin. All are living in a world beset with snares, traps and pitfalls for the soul. All have near them a busy, restless malicious Devil. All from the Queen in her palace down to the pauper in the workhouse, all must fight. It is a fight of perpetual necessity. It admits of no breathing time, no armistice, no truce. On week-days as well as on Sundays – in private as well as in public – at home by the family fireside as well as abroad – in little things like management of tongue and temper, as well as in great ones like the government of the Kingdoms – the Christian’s warfare must unceasingly go on. The foe we have to do with keeps no holidays, never slumbers and never sleeps. So long as we have breath in our bodies we must keep on our armour and remember we are on an enemy’s ground. “Even on the brink of Jordan,” said a dying saint, “I find Satan nibbling at my heels.” We must fight till we die. We may take comfort about our souls if we know anything of an inward fight and conflict. It is the invariable companion of genuine Christian holiness. It is not everything, I am well aware, but it is something. Do we find in our heart of hearts a spiritual struggle? Do we feel anything of the flesh lusting against the spirit and the spirit against the flesh, so that we cannot do the things we would? (Gal. 5:17). Are we conscious of two principles within us, contending for the master? Do we feel anything of war in our inward man? Well, let us thank God for it! It is a good sign. It is strongly probable evidence of the great work of sanctification. All true saints are soldiers. Anything is better than apathy, stagnation, deadness and indifference. We are in a better state than many. The most part of the so-called Christians have no feeling at all. We are evidently no friends of Satan. Like the Kings of this world, he wars not against his own subjects. The very fact that he assaults us should fill our minds with hope. I say again, let us take comfort. The child of God has two great marks about him and of these two we have one. He may be known by his inward warfare, as well as by his inward peace. Here the apostle sets before us what should be the resolve of every Christian through grace – to guard the mind. There is in this evil day a constant, concerted attack upon the minds of God’s people. We are daily exposed to a brainwashing process. Radio, television, videos, the press and various publications are all instruments hijacked by our subtle enemy to reach our minds. The media constantly presents sin as acceptable in modern society. Drinking, adultery and unfaithfulness are presented as socially acceptable and the common norm. The unsavoury filth of the world should never be allowed to seep into or sully the mind of the Christian. He must gird up the loins of the mind, as the pilgrim on a journey girded up his robes with a girdle so that he might walk unhindered. So let us keep our garments unspotted from the world and gird our minds lest they get caught up and entangled in the philosophy and thinking of the worldling. Paul speaks of “loins girt about with truth” (Eph. 6:14). Here is the mind girt and encircled with the Word of truth and hedged about with the power of truth. Feed your mind and soul on the manna of Christ in His Word. Keep your mind’s eye on Christ and it will not be able to fix itself on the world. Remember, loose thinking must inevitably lead to loose living. He hath made every thing beautiful in his time. We believe that whatever the Bible says is true. Yet sometimes experiences cause us to question whether certain things are personally relevant. The tension between doctrine and experience is a common test of faith. Solomon’s conclusion that God has made every time beautiful and appropriate is one of those great statements easy to believe in good times and easy to apply to others in their bad times. The key is to believe it during our own bad times. Believing that God has a purpose that embraces everything in life and that His plan is beautiful regardless of its manifestation is the secret to enjoying the life that God has given us. Solomon leads up to this all-embracing statement by setting forth all the times ordered and ordained by God. Ecclesiastes 3 begins with a list of fourteen pairs of defined times that together represent all possible times in life. Nothing, absolutely nothing, happens by chance, accident, or fate. Everything, absolutely everything, happens according to God’s design. Our efforts and worries cannot alter His eternal plan for us. Whereas unbelievers may regard themselves as the masters of their fate or the captains of their souls, we as believers know that our times and destinies are not only in God’s good hand, they are part of His infinitely wise plan. Our life is a privilege; our life is God’s purpose. In the good times, we should humbly acknowledge that God has made all times beautiful. In the hard times, we should confidently rest in that beauty. That God is sovereign over the affairs of life is true whether we believe it or not. Believing it is the only thing that gives sense to life. as well as the sovereignty of grace. All enamelled and interwoven with free grace! “For ye see your calling brethren, how that not many wise men after the flesh, not many mighty, not many noble, are called: But God hath chosen the foolish things of the world to confound the wise; and God hath chosen the weak things of the world to confound the things which are mighty; And base things of the world, and things which are despised, hath God chosen, yea, and things which are not to bring to nought things that are; That no flesh should glory in His presence” I Corinthians 1:26-29. Without this effectual call – there is no going to Heaven! This effectual call, is a gracious call. It is the fruit and product of free grace! That God should call some – and not others; that some should be taken – and others left; that one should be called who is of a more wicked disposition – while another of a sweeter temper, is rejected. Here is free grace! That the poor should be rich in faith, heirs of a kingdom (James 2:5), and the nobles and great ones of the world for the most part rejected; this is free and rich grace! “Even so, Father, for so it seemed good in Thy sight” Matthew 11:26. That under the same sermon one should be effectually wrought upon – while another is no more moved than a dead man with the sound of music; that one should hear the Spirit’s voice in the Word – while another does not hear it; that one should be softened and moistened with the influence of Heaven – while another, like Gideon’s dry fleece, has no dew upon him; behold here distinguishing, sovereign grace! What is the cause of this – but the free grace of God! It is all enamelled and interwoven with free grace! Those who are monuments of God’s mercies – will be trumpets of His praise. “That no flesh should glory in His presence” I Corinthians 1:29. Continue Reading | Comments Off on All enamelled and interwoven with free grace!